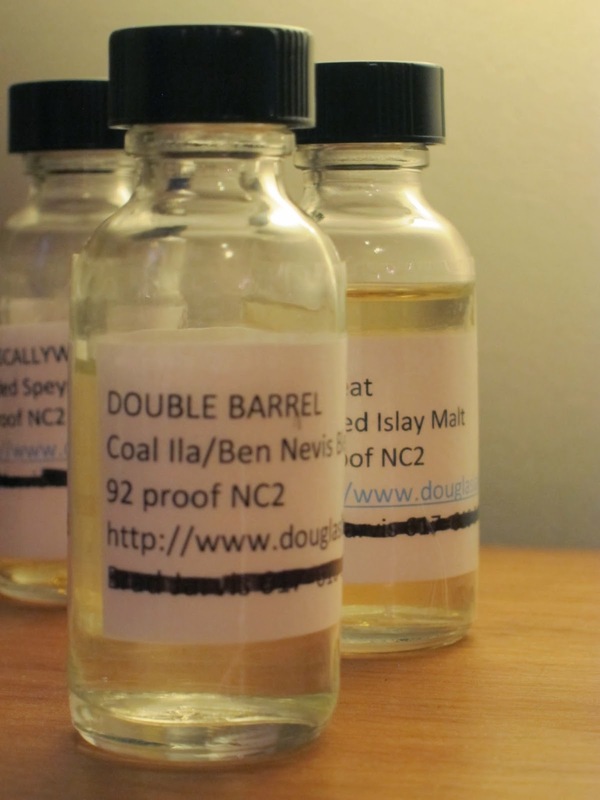 Double Barrel Caol Ila / Ben Nevis (46.0%): A new expression from Douglas Laing & Co. Ltd.'s Double Barrel series. After being introduced with a Macallan / Laphroaig bottling Double Barrel series got quite popular among whisky lovers. Each expression is blended using casks from two distilleries only and it looks like Douglas Laing folks have a tendency to bring distilleries together you wouldn't necessarily think as the perfect couple. This one is a marriage of casks sourced from Caol Ila and Ben Nevis. Color: Almost clear. If you hold it to the light you barely catch a glimpse of saffron yellowness. Nose: Beautiful young Caol Ila: rubber bands, fresh cut grass, old school iodine tincture (the ones that used to hurt like hell) and diesel fuel. A few drops of water opens it up with flowers: Hyacinths, lavender and thyme flowers. Actually I get quite a lot new make aromas as well. In a best possible way though, like walking in a still room of a distillery on a cold winter day. Palate: Salty and grassy. The numbing spray dentists spray all over your mouth just before they use the anesthetic syringe. Band aids, warm sourdough bread and olive brine. Fresh rosemary leaves, rose jam and salted butter. Finish: Long with young alcohol burn on the tongue and extra fine grind black pepper. Overall: I loved it! But I can easily admit that I cannot possibly imagine a second person who would like this dram as much as I did. I have a known weird soft spot for young peaty whiskies matured in ex-bourbon barrels and here we go... It is a very young, aggressive and hot dram which wouldn't suit everybody's palate but it's damn tasty. Perfect snowy day dram, the one to fill in your flask before you start your winter hike. I don't know by the way where Ben Nevis casks disappeared in the bottle. Maybe, maybe in those rose petal notes I dug out of nowhere but mainly it was Caol Ila all over. Like always many many thanks to Brad Jarvis a.k.a. The Whisky Professor for the official sample.